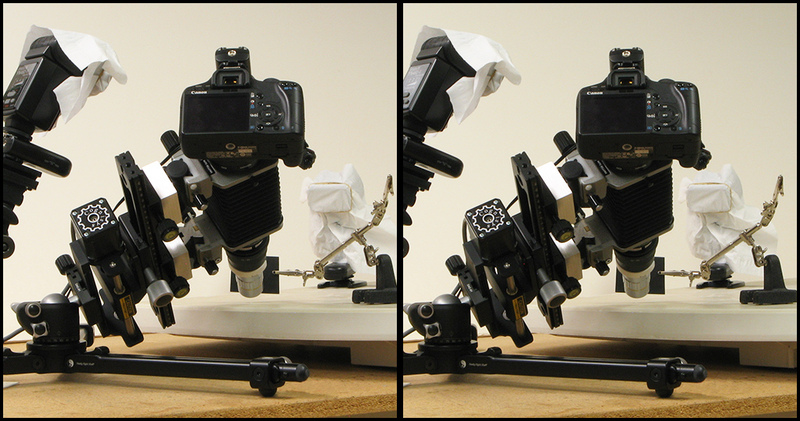 This is the setup that I used to shoot the Weathered plastic table over in Technical & Studio Macro. Yongnuo flashes and RF triggers. I've been quite pleased with the stability of this tabletop tripod and ballhead. No problem at all using it at 10X, as here. I haven't tried pushing it higher, solely from lack of need. I think it would work fine at 20X, at least. From a lower angle, in stereo, the setup looks like this. Normally I don't bother with stereo for equipment shots, but I thought it added some clarity to this one -- at least for those who are able to see stereo! I'm sure that somebody's going to wonder about that Kleenex tissue over the flash heads. That's mostly habit, to avoid any possibility of interesting patterns reflecting in mirrorlike surfaces like ommatidia. For explanation, here are straight shots into the head of that Yongnuo flash, with and without the tissue fastened over it. 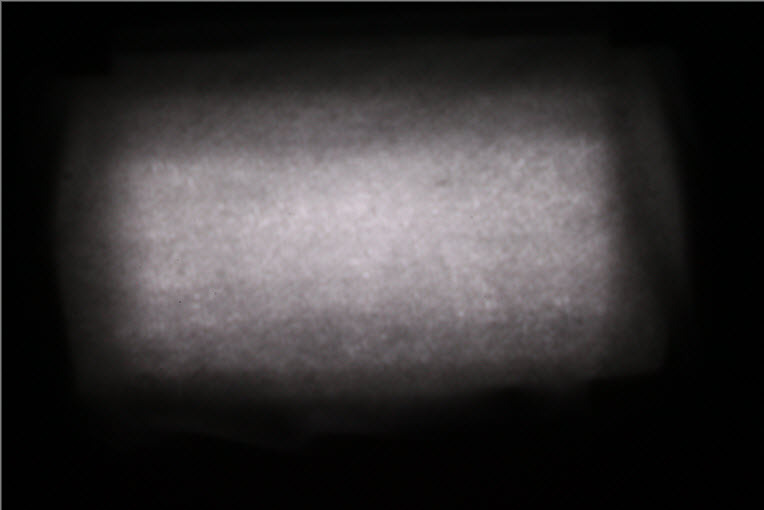 As you'd expect, the tissue doesn't make the light source much bigger, but it does make it quite a bit less structured. That probably doesn't make a whit of difference for this particular application. By the way, anybody wanting to look at their own flashes in this way should be prepared for a bit of struggle to keep the image from blowing out. Despite lowest flash power and ISO 100, I finally had to resort to shooting through a pinhole in black paper, about 0.4 mm with a 100 mm lens so effectively f/250. The diffraction blur is pretty awful, but it's good enough for illustration. Nice tripod and head. Though they would cost north of $1000 in the UK . With the legs flat, does it "bounce"? They're not cheap here in the US either. But I was impressed with this tripod when I encountered it at a conference, so I steeled myself against the pain and placed the order. No regrets. Using this tripod flat has now become my favorite configuration for live demos. Not perceptibly. It's much more rigid than I expected it to be. I still had this configuration set up, so I just now tested to see how much the framing through that 10X objective would change if I pressed downward on the ballhead. The answer is less than 0.5 mm (1/4 of frame height) for what I separately measured as 8-10 pounds of hand pressure. I have several sets of tripod legs and heads, in varying sizes. Each set cost roughly $1,000 USD, so my sense is that a kilobuck is generally what a good set costs. Each of my sets is, in my opinion, worth the investment. I was thinking of inclination to vibrate, rather than bend. A screw down foot under the centre, would make things more rigid. Flat legs, cosx = 0, ugh! 10lbs, half mm gives about 50Hz, if my spring calc scribble is right. Not really ideal. RRS equipment is good, but overpriced, considering production costs. And yes, political contributions of RRS owner can have certain significance to people. To get oblique angles I've mounted a very solid old Bogen cine ball head directly onto a $30 slab of granite which I drilled to fit the ball head mounting screw. I would put the rigidity of this up against any tripod out there, even a $2000 one. Not easily portable though. The objective looks really close to the surface there. I assume that is the shallowest angle you could achieve because of that? My current set up was made so it can be adjusted for various angles using a microscope focus block as its mechanism( http://www.photomacrography.net/forum/viewtopic.php?t=28383 ). Some time after the holidays I plan on adding a digital angle gauge to it, so I can set a precise angle with less fiddle. As well as grabbing a couple lab jacks to easier subject positioning under it at an angle. As viewed at maximum magnification Live View, it takes about 2 seconds for any vibration to die out, even the relatively slow stuff that appears as movement, not blurring, in Live View. This is true even if I rap directly on the objective, rather than the ballhead. In the grand scheme of things, it's completely unclear to me where the major sources of flexibility are. 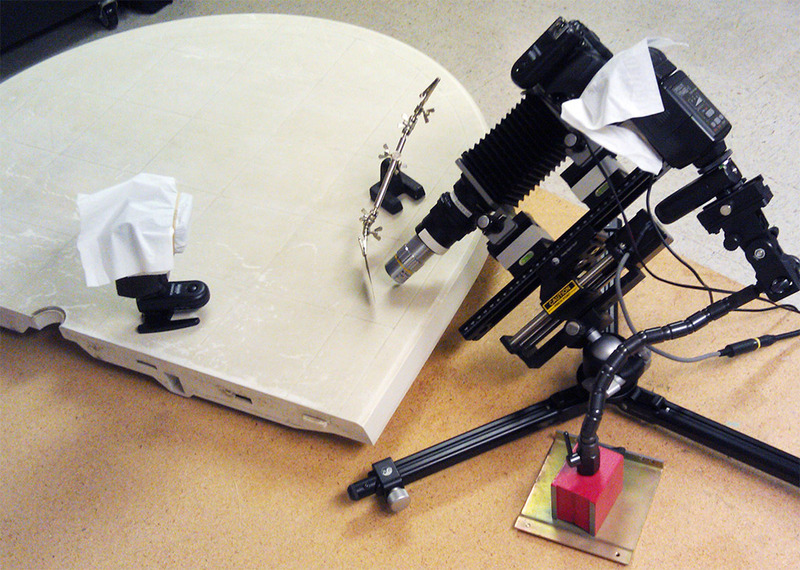 Pressing on the fiberboard benchtop near the front tripod foot produces a shift in framing similar to pressing on the ballhead. Pressing on the bellows rail produces more, pressing on the camera even more, and on the objective most of all. In all those cases the system shows the three bits of behavior that I consider most important: 1) it is stable enough to frame and focus easily, 2) it returns to steady state without permanent shift in about 2 seconds, and 3) the image in Live View strongly suggests that the setup is stable enough to shoot using continuous illumination and EFSC if I were to take the usual precautions of turning off the house fan, putting the cat out, bribing the spouse to stay away, and so on. I will happily agree that the setup is "not ideal", but it is one that I will use again if a similar need arises. Not quite, but getting there. At closest approach, the objective is a little over 6 mm above the surface. With 33.5 mm working distance, that means about 10 degrees potential for a lower angle. If I were operating at full NA 0.28, that would be about the limit. 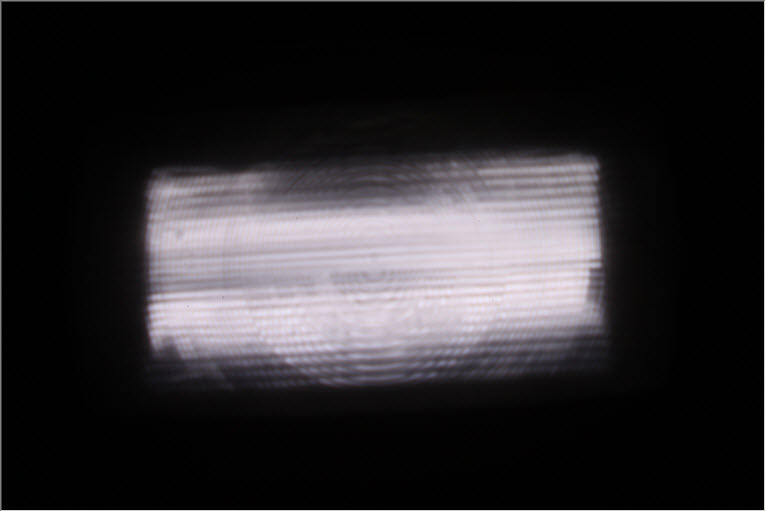 However, in order to get more DOF (at the cost of resolution), I stopped down the auxiliary aperture to about 5 mm diameter, giving about NA 0.12 . The half-angle at NA 0.12 is about 7 degrees, so that would be the minimum viewing angle of the central ray if I moved the objective back over the edge of the table, so as to focus on a point closer to the edge. One obvious deficiency in this setup is that there's no fine control for framing. That was not an issue when I just wanted to shoot any random part of the surface. But when I added the bristle and hair, I was then faced with accurately positioning a roughly 1.5 x 2.2 mm frame attractively centered on the bristles. Fortunately the plastic tabletop is not very heavy, so that was simpler than I had feared. Just sliding the whole thing around worked fine. One additional tradeoff I didn't mention is that it takes forever to drill a hole in granite. There are special drill bits for this. I used a drill specialized to drill porcelain. It took half a day to drill one hole. Marble is much softer and can be easily drilled with ordinary drill bits for drilling metal. But marble is brittle. Initially I had a catastrophic failure (marble slab breaks in half) of about once in every six holes drilled. Not acceptable when building complex supports that require a dozen holes per slab. My solution was to start with a very small drill bit, and then work up to larger and larger bits, going through five or so size steps to get to the final hole size. Now I have 100% success-- I have not broken a marble slab again. Also, pour water on the hole as you drill, and cool the bit in water frequently. The marble gets hot enough to boil water and the drill bit can get red hot. Extreme localized heat like this might facilitate marble cracking.